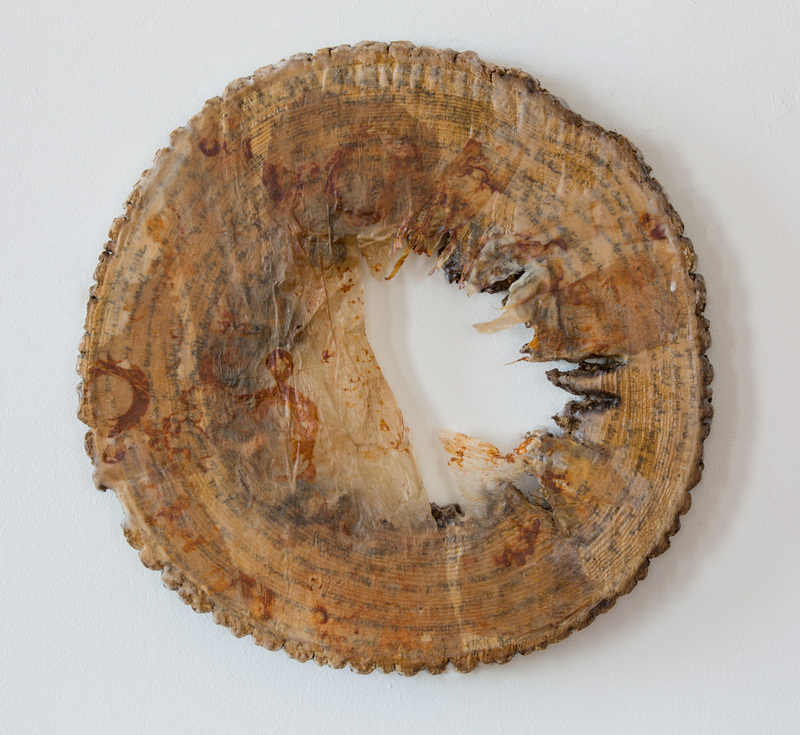 Artist of the Month: Christine Aaron | Where is Paperwoman? Do you have the winter blues? Right now, if you are in the New England area, you might say: “yes!” We have had quite the winter so far, with snowstorm after snowstorm, and bitter cold to boot. However, with my amazing staff we have been able to keep our tight paper-ship running, sending out orders, and meeting with various paper artists who enjoy the experience of visiting our warehouse and showroom. There was one special visitor by Ms. Christine Aaron, who between blizzards drove to our humble headquarters all the way from Porchester, NY. Her presence thoroughly warmed up the season; especially her joyful smile and pure enthusiasm for creating art- just the medicine we needed to cure the winter blues. 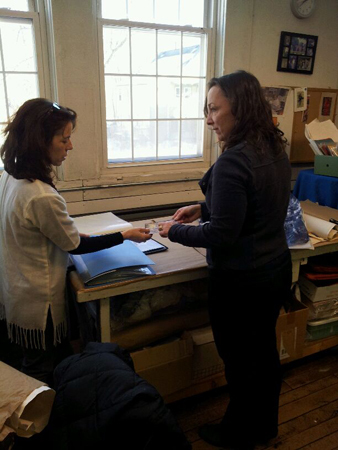 Enjoy Christine’s interview, as well as images of her works and from our warehouse. We know it will cure any cabin fever you may be experiencing this winter. PCI: Please tell us about your background, Christine, and what kind of artwork you do. 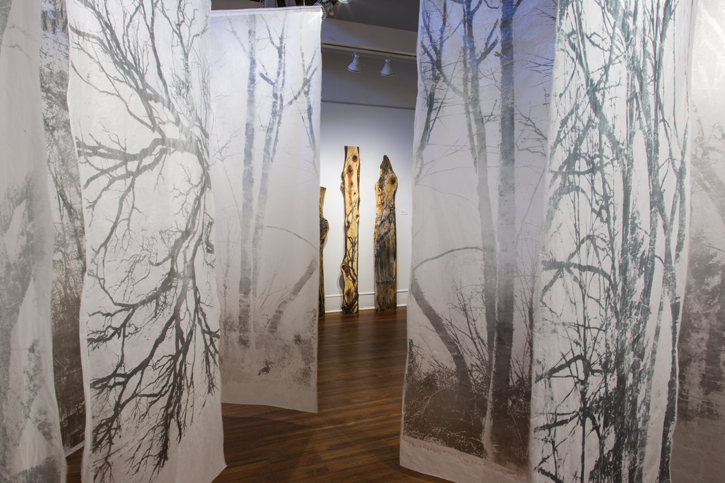 CA: I’m a mixed media artist whose current mediums of choice are printmaking and wax, employed on a variety of substrates such as paper, metal, mirror and wood. 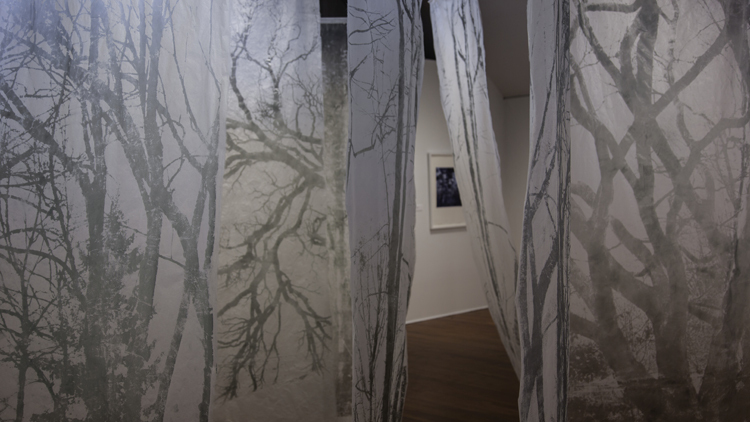 In my last few series, I am using tree imagery as symbolic of memory, life’s record and the passage of time. PCI: What inspires you? Which artists have influenced you? CA: I find inspiration from so many sources. Some of these might seem more apparent in my work, others less so. Trees, both living and deteriorating, of course! I admire and respond to a wide range of artists’ work, not stemming from any particular group or “type.” Current favorites are Anselm Kiefer, El Anatsui, The Gees Bend quiltmakers, Emilie Brezinski, Lynn Geesaman, Klimpts landscapes, Thiebauds landscapes. I am recently very intrigued by and drawn to outsider art. I try to go to visit museums, galleries, and go to the exhibits of artist friends and contemporaries. The good and the bad of it is that the sources of inspiration and therefore possibilities of choice/direction within my work are endless. CA: It’s versatility! It’s reception of any medium. The fact that paper can assert its presence, or visually disappear. Its uses range from the diaphanous to the sculptural, and there is a paper for every artistic need possible. PCI: What do you like best about working with paper? Have you ever made paper? CA: I have never made paper though it has always been of interest to me. There are so many options when you engage artistically with paper and I feel like I am just beginning to scratch the surface as to its possibilities within my artwork. PCI: This is so true. We have been in the world of paper for over twenty years now and it’s amazing how much more you can learn, regarding how it’s made to each sheet’s qualities. So how did you hear about Paper Connection? 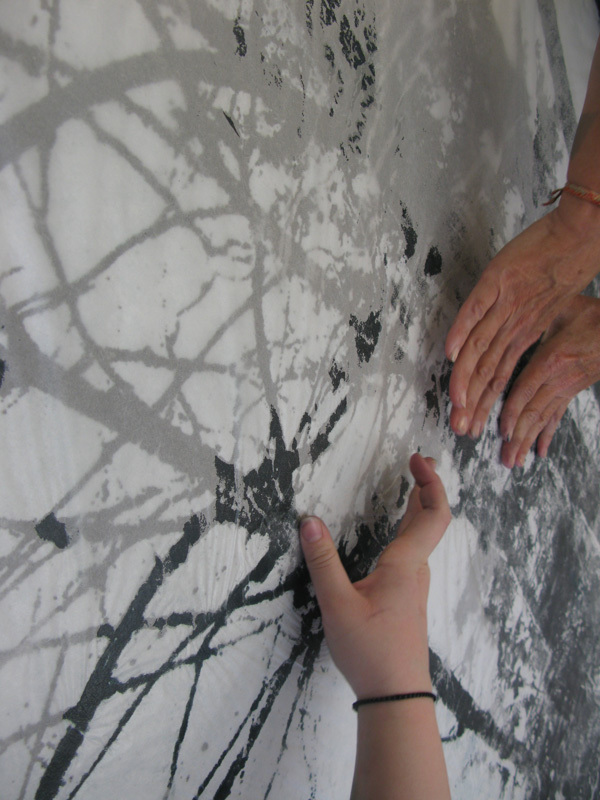 CA: I was introduced to Paper Connection at the 8th International Encaustic Conference in Provincetown, Mass. It’s an annual conference conceived and run by Joanne Mattera, and now co-run with Cherie Mittenthal of the Truro Center for the Arts, that focuses on the medium of wax, and professional development within that field. The vendor room is a smorgasbord of supplies and Paper Connection was one of the vendors. PCI: And we enjoyed participating in that conference. 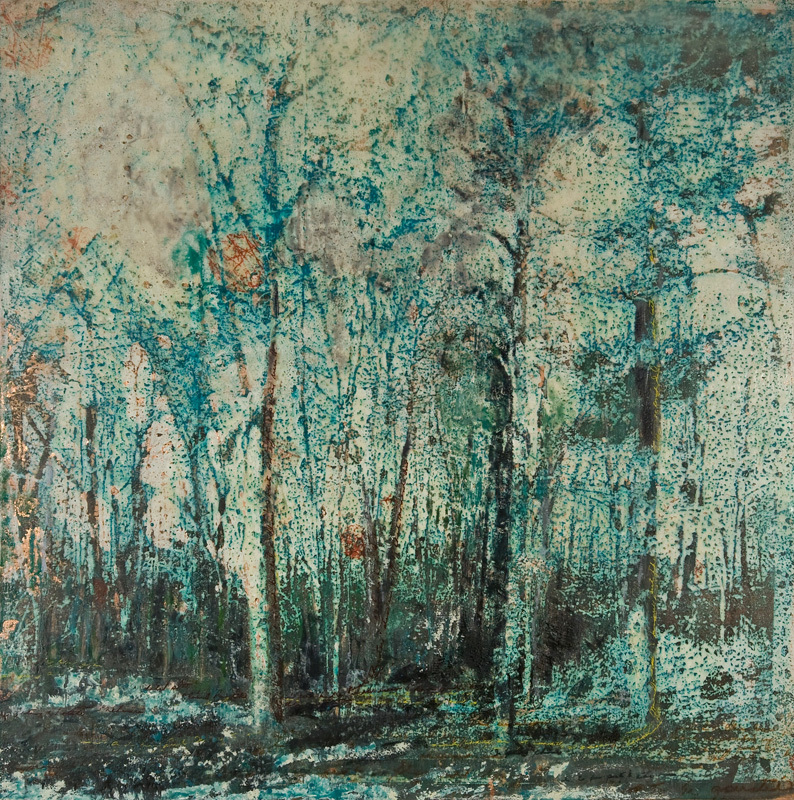 The members of this encaustic group are very supportive of each other. Paper Connection felt welcomed from our first experience, particularly by artists like yourself. We are grateful to know you and have been vendors at this conference every year since. How much did you know about Japanese or Eastern papers before using our selection? 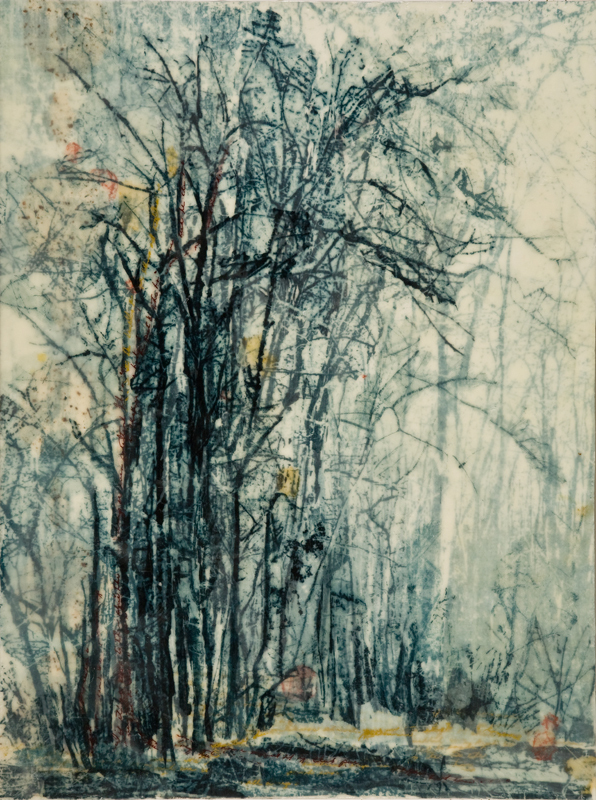 CA: I have been using and experimenting with some Japanese papers both in my printmaking (chine colle) and with layering imagery in my work with wax. My “go-to” was a Japanese “silk tissue” and I was struggling to find something similar for an installation I was creating for a solo exhibit. I could not find any source that had this paper in rolls, (only sheets). PCI: How did we help? CA: Lauren was incredibly patient, and knowledgeable in discussing what my needs were, and suggesting possibilities. 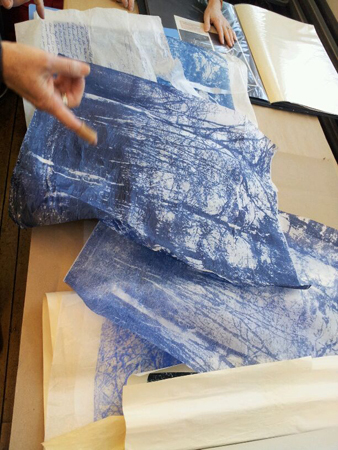 I had tried an usukuchi (rayon) paper, and though transparent it didn’t have the “feel” I was looking for. 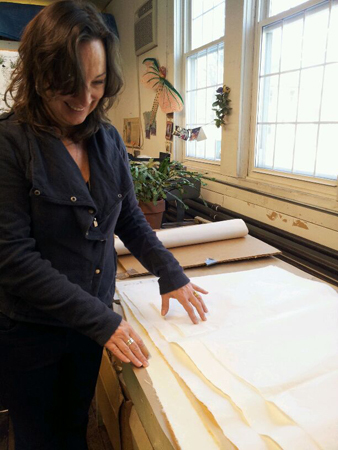 Lauren told me that Paper Connection had rolls of both white and natural gampi, (what I had known as Japanese silk tissue). I bought it on the spot. And then once I experienced printing on it…I ordered lots more! PCI: For which we were so grateful! What do you like about gampi paper and how do you incorporate it in your work? CA: This paper is fantastic. 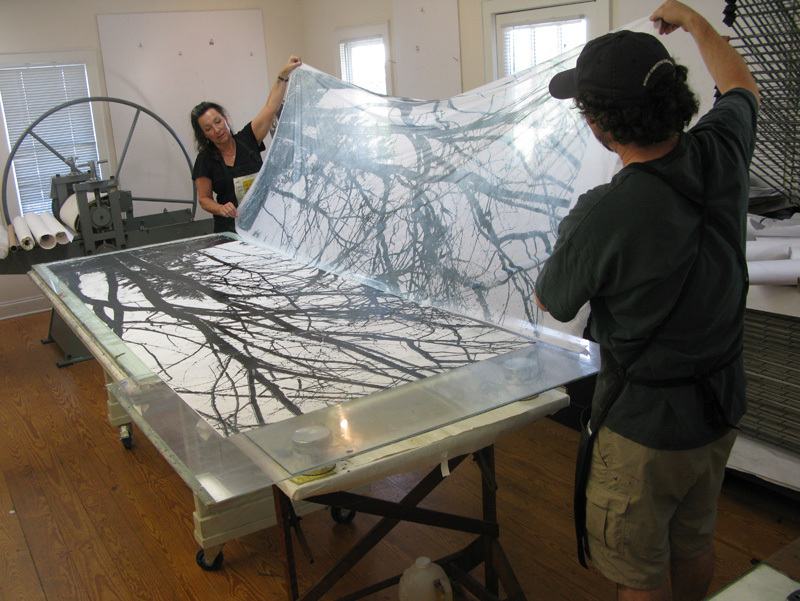 Translucent to the point of transparency when printed on, strong yet fragile, it worked beautifully with my imagery. 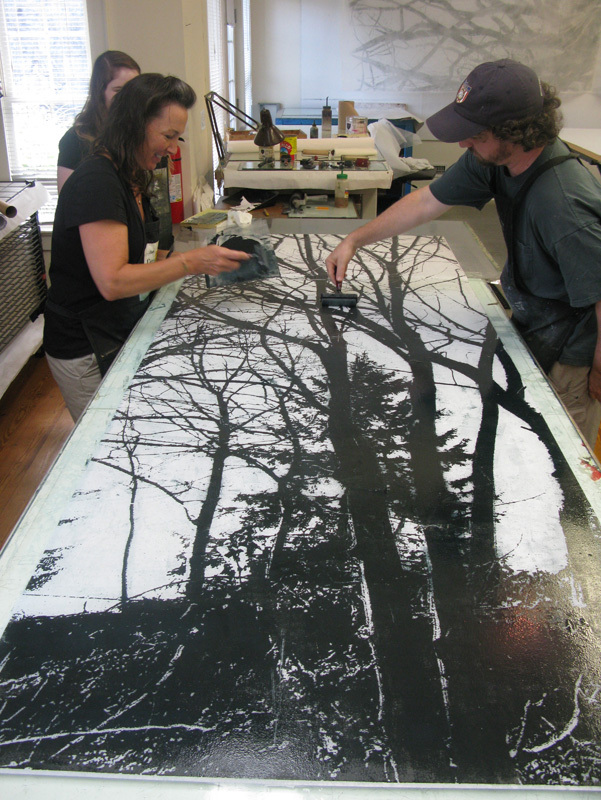 I hand printed multiple 36 x 102 inch panels for my installation. Once hung, they would gently move with any air current, and almost “followed” viewers as they walked through the panels(the movement generated by the air currents of the people). In addition, the sound they made as they moved was lovely…a whisper that added to the audio part of the installation. PCI: Paper and Sound…aaahhh! 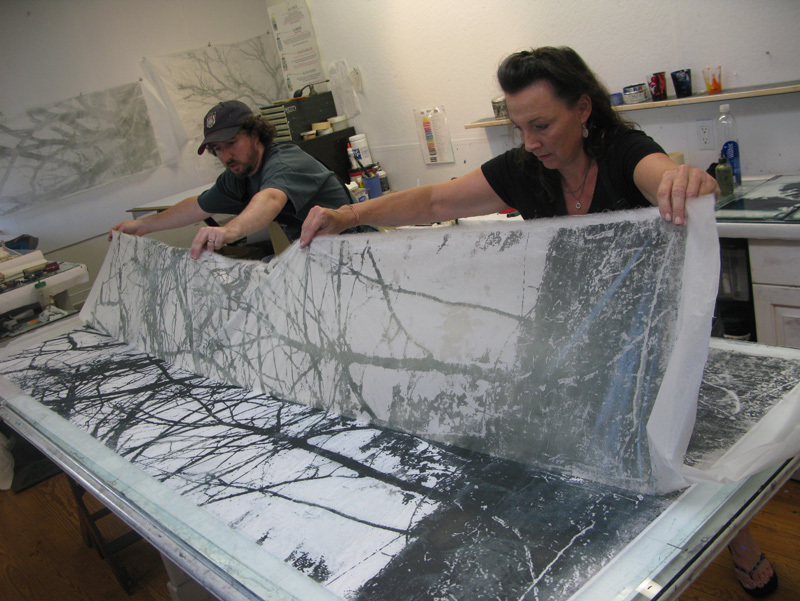 We’re always telling clients “listen to the sound of gampi”…..
We carry rolled papers with artists like you in mind, for larger format prints and installation pieces. What did you like about those papers that aided in your creative and/or technical process? CA: The rolls of usuyou gampi worked beautifully for my installation. 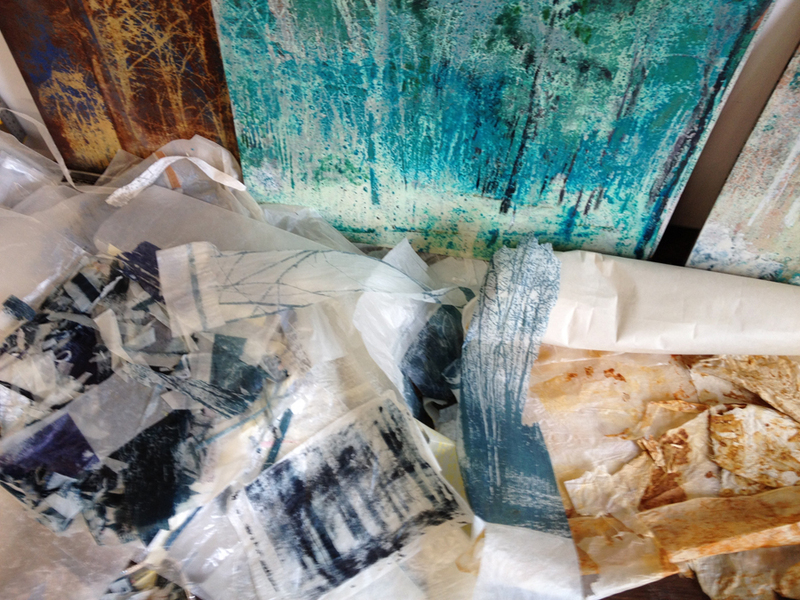 I also use many Japanese papers in my print and mixed media work. I frequently write or print (oil based paper lithography, hand transferred), on them, and then tear up and reassemble, and layer the imagery as part of a larger composition. Recently I have been experimenting with using these papers dipped in wax, where the paper asserts itself more sculpturally. 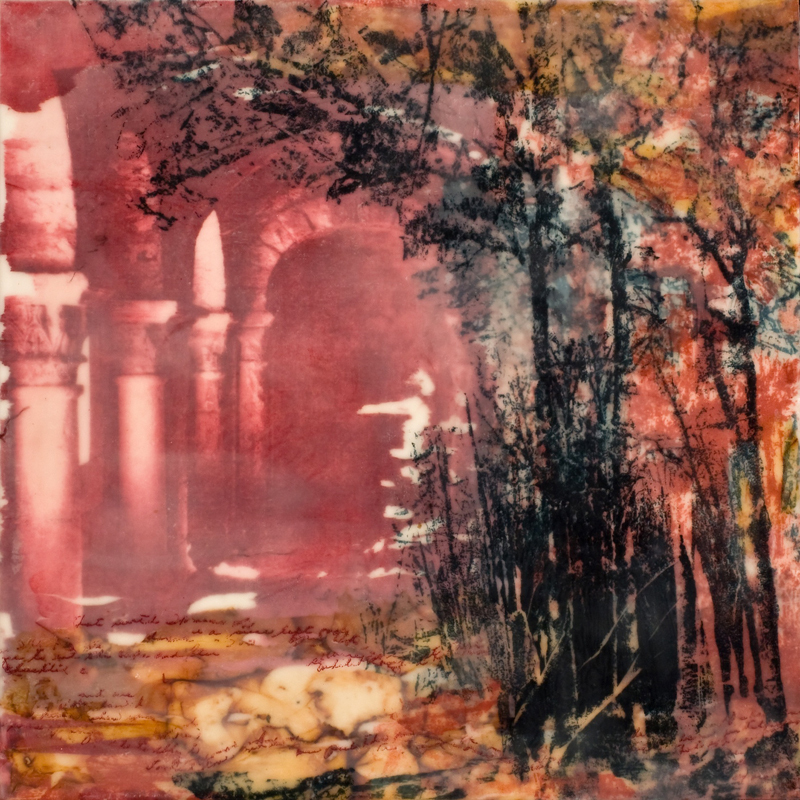 PCI: We are so happy that gampi paper works well with encaustics. What are the differences between our papers and others you have worked with? CA: I’m not sure I can speak to the differences, since I feel like a novice in this area. However, I will say having someone as knowledgeable as Lauren with whom to speak, makes a huge difference in being able to find the right paper for whatever I’m working on. CA: The Usuyou Gampi for layering within any mixed media work. PCI: If you could have a conversation with any artist present or past, who would it be? Would you talk about paper? CA: I have tried to answer this question numerous times and there are too many artists to list and questions to ask! Well said. Our dear readers can imagine which artists are in our imaginary paper salon this month. Thank you Christine, not only for the interview, but taking usuyou gampi paper to new horizons and heights. Photographs featuring Christine printing were taken at the Center for Contemporary Printmaking with Christopher Shore. Thank you for use of the images.